Rainworth MW will go into Saturday’s home local derby against promotion-chasing Worksop Town in good heart after two successive wins. But manager Julian Watts admits that Mark Shaw’s Tigers will prove a different kettle of fish after Saturday’s comfortable 4-1 win at bottom club Brigg Town. This will be the first time the two sides have ever met in competitive action, although Worksop did visit Kirklington Road for a pre-season friendly which the Wrens won 4-0 - in direct contrast to the seasons experienced by the respective clubs afterwards. Speaking after the match at Brigg, Watts admitted that the Wrens looked a bit laboured at times, and added his disappointment at the penalty decision from which Brigg scored their only goal just before half time to make it 2-1 at the turnround. But he added: “We totally dominated the first half, and they barely got a kick, which was pleasing. We added a couple of goals to that, which we haven’t always been able to do this season, so for them to get a debatable penalty so that we only led 2-1 was disappointing. “We needed that third goal which came in the second half, because I look back at goals we concede and we don’t always make our opponents work as hard for them as we should, so it was good to get that cushion back. I felt that once we did we could relax and go on to play a bit more good football, which is what happened. 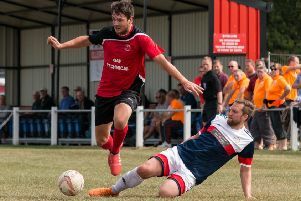 Debutant centre back Craig Morley weighed in with the fourth goal to crown an impressive start after his arrival from Clipstone, and earned the praise of his new boss, who continued: “It was a fantastic debut for him and his goal at the end was the icing on the cake. We had three centre-halves missing on the day, so he has come into an unfamiliar defence and marshalled it well. Looking forward to the visit of Worksop, Watts said: “Every game is different, and they are up there at the top of a very strong league. The match will be preceded by a Worksop U9s boys’ and girls’ game, which will entertain an expected large crowd given Worksop’s away following. The juniors’ game will mark Non-League Day, which is meant to give the chance for Premier League and Championship club supporters to watch their local clubs in action while those two divisions take a day off. However, with Mansfield Town also at home, the Wrens are not marking the day in any other way. Stags fans are already entitled to concessionary admission on normal match days at Kirklington Road when their own team are away or not playing.